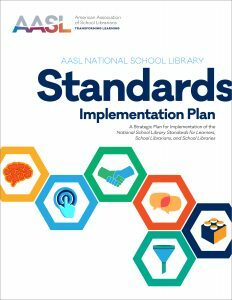 The implementation plan provides an implementation and advocacy roadmap for the association and its volunteers, members of the profession, and school library stakeholders engaging with the AASL Standards. 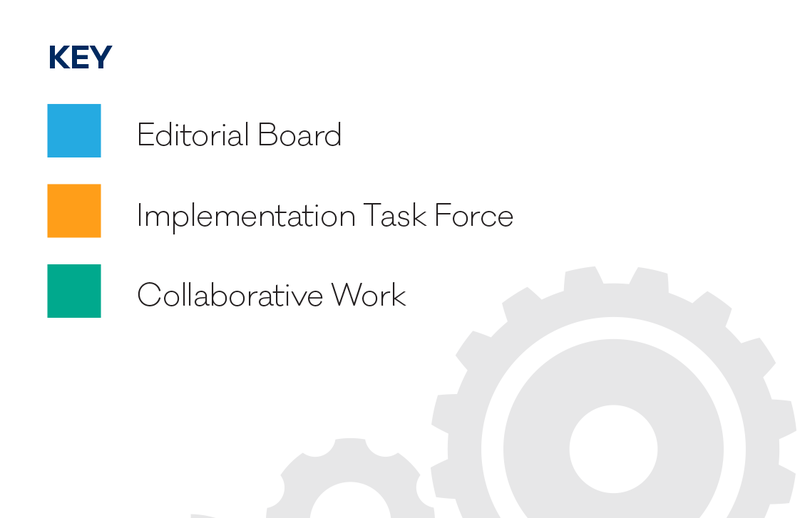 In September 2015, while the standards editorial board was conducting research, a standards implementation task force began work on plans for implementation. These two groups working in parallel allowed AASL to develop and provide tools and resources to assist with training and implementation immediately upon release of the new documents in the fall of 2017.
building awareness, understanding, and commitment to using the standards to guide school library practice. The plan was intentionally designed to speak to specific audience segments. It explains AASL’s standards, engages early adopters in developing exemplars of practice, and equips school librarians to understand, apply, and use the standards in their local educational settings. In addition, the plan reflects the association’s strategic goals and addresses profes­sional development, marketing communication and branding, and advocacy and com­munity engagement. The broad goals, drafted as 4 Es (Explain, Engage, Equip, and Evaluate), succinctly describe what the plan intends to do. Each objective describes and organizes specific, measurable, and time-bound action steps. Goal 1. Explain the structure, purpose, and value of the AASL Standards to school librarians, stakeholders, and partners beyond the school community. 1.1 Develop consistent, sharable branding and messaging for the standards to be used across traditional and social media. 1.2 Introduce AASL Standards to key stakeholders, including state and regional school library leaders, national educational organizations, state departments of education, and school administrator organizations. 1.3 Create and sustain excitement and conversations about the AASL Standards. Goal 2. 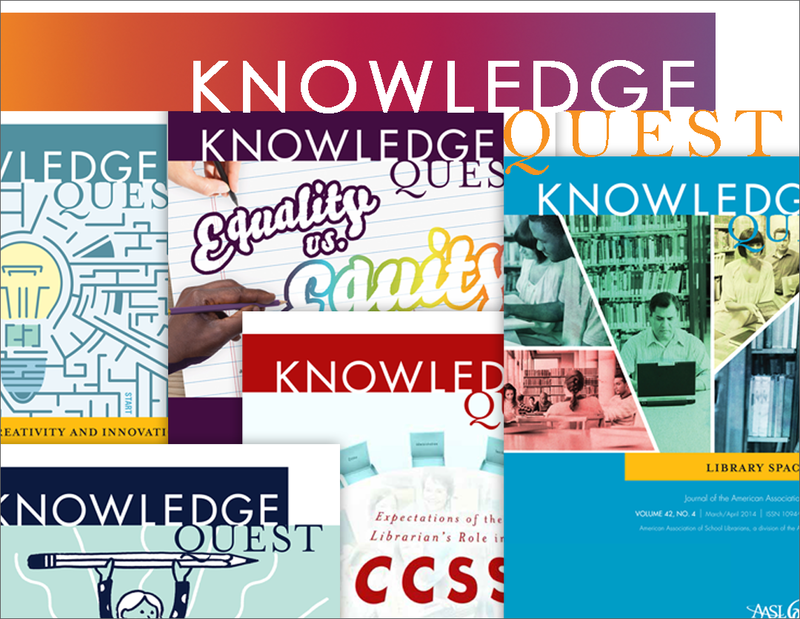 Engage innovators in developing tools to explain the structure, purpose, and value of the AASL Standards to school librarians, stakeholders, and partners beyond the school library community. 2.1 Identify and engage with “movers and shakers” in the school library profession. 2.2 Encourage practitioners to develop and share implementation models and metrics for AASL Standards. 2.3 Engage with stakeholders outside the profession. Goal 3. Equip practitioners to understand, apply, and use the AASL Standards in their educational settings. 3.1 Design professional-development opportunities for practitioners. 3.2 Foster building personal learning networks and crowdsourcing of resources related to the AASL Standards. 3.3 Ensure implementation support through AASL publications, websites, and online tools. 3.4 Prepare library and information science and continuing education faculty members to integrate the AASL Standards in university programs of study. Goal 4. Evaluate progress toward implementing AASL Standards and adjust for changing conditions. 4.1 Document effectiveness of AASL Standards implementation efforts. 4.2 Review and adjust implementation strategic plan for continued relevance. The Concerns-Based Adoption Model (C-BAM) is a framework for understanding the stages that learners move through as they adopt innovative practices. This model inspires and fosters empathy for the variety of ways that people respond to change initiatives and professional development experiences. The task force used this model to better understand the process that practitioners and stakeholders move through as they adopt the new standards and to better understand why we need to provide different learning experiences for adult learners. 1. Preparation The user has definite plans to begin using the innovation. 2. Mechanical The user is making changes to better organize use of the innovation. 3. Routine The user is making few or no changes and has an established pattern of use. 4. 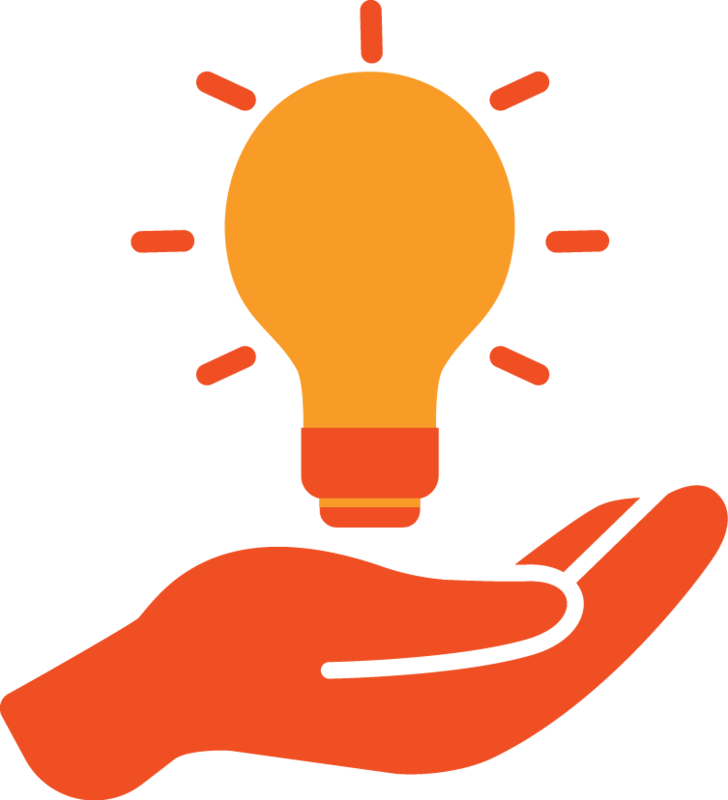 Refinement/ Integration The user is making changes to increase outcomes and making deliberate efforts to coordinate with others in using the innovation. 5. Renewal The user is seeking more effective alternatives to the established use of innovation. Ellie Drago-Severson, building on Harvard Professor of Education Robert Kegan’s Constructive-Developmental Theory, created a framework for understanding adult learners. Like our young students, adult learners have different perspectives and different ways of knowing and, therefore, different learning needs. And like our young students, adult learners develop over time, spiraling upwards toward richer ways of knowing and relating to others. are willing to be changed by collaboration and are focused on the exchange of ideas and perspectives. It is important to note that individuals may have different ways of knowing for different things. For example, a new librarian may be an instrumental knower about the AASL Standards AND a self-authoring knower about using technology to support learning. All learners will have instrumental needs; concrete information is necessary when learning new material. The goal is twofold: to meet adult learners where they are and to help them move up the spiral toward deeper understanding. To identify specific adult learning needs, the standards implementation task force constructed character profiles or personas to represent different groups who share similar traits, beliefs, attitudes, and values with regard to school libraries. 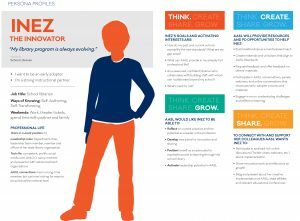 These personas were designed to cut across categories of stakeholders and unify them into fewer, but clearly defined, user groups that AASL wants to reach with the standards. In the context of school libraries, customer or user segments include learners, school librarians, other educators, administrators, parents, and other stakeholders in the learning community. While the personas created cannot accurately represent every future user of the standards, the task force strived to create a useful tool for considering how the new standards will be used by real people in various contexts nationwide. By transforming the patterns found in the research into people with faces, backgrounds, and passionate questions of their own, the task force kept the needs of stakeholders and users at the forefront of the design of the implementation plan. A central principle of this implementation plan is that it honors adults as learners and includes multiple pathways for different learning needs. The implementation task force understood different user groups would respond differently to messages and require different entry points. Dilemmas were solved by returning to a common understanding of the user’s experience to considered how he or she would respond to the products in mind. Although this approach resulted in a complex web of initiatives and products, the plan created is global, straightforward, and simple. The primary goals and objectives are brief. The real work is embedded in the action steps. These action steps engage all members in learning, applying, and sharing their experiences as they implement the standards. Counting Down to Standards Release! This Gant chart helps to further illustrate the parallel working timelines and collaboration points between the standards editorial board and the implementation task force to create your new standards and to ensure implementation support is available immediately upon launch.